Louis Vuitton’s latest collaboration with world-renowned American artist Jeff Koons has been met with mixed reviews. Some describe it as “a joyous art history lesson” while others liken it to “a souvenir bag from a museum gift shop.” Our forum members weren’t quite as kind. Still, the sure-to-wind-up-on-eBay collection is likely to find many fans amongst the fashion set. 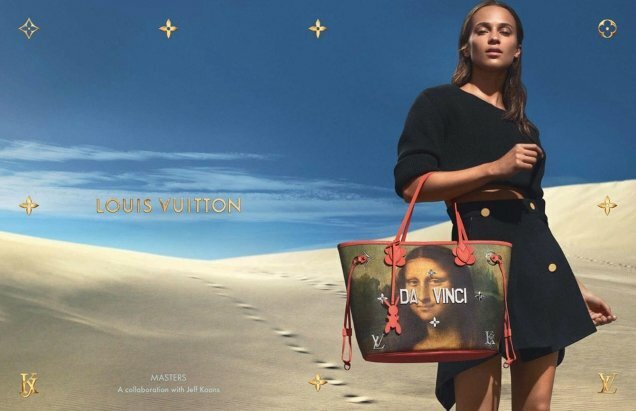 The new campaign promoting the Vuitton x Koons collection stars Nicolas Ghesquière’s muse Alicia Vikander, captured by Mert Alas & Marcus Piggott. Our forum members seemed to like the campaign about as much as they liked the collection. “A boring actress and tacky looking bags, what a disaster for LV,” exclaimed a horrified liberty33r1b. “I still don’t understand why they try to make Alicia happen, to me she’s so weak,” echoed an underwhelmed badgalcrush. “Wow, that bag is ugly! This legitimately looks like the fake desert LV campaign [from Spring 2004] by M&M,” said anlabe32. Magsaddict couldn’t have agreed more. “Lazy and uninspired, sorely lacking the presence of a professional model,” she confessed. “Ugly collection deserves this bad campaign. I’ll be buying a better souvenir at The Louvre gift shop,” mocked a far-from-impressed TaylorBinque. “I’m guessing the gift shop at The Louvre must have served as inspiration,” laughed GivenchyHomme. “Horrible collaboration with a campaign to match. Perfect,” declared Nomar. Better luck with your next collaboration LV! Await more from Alicia’s new campaign here and check out the Vuitton x Koons collection below.